A decade of war hasn’t done much good for the country, but it sure has been good for the Red Sox. Fenway Park, Boston, July 4, 2011. On this warm summer day, the Red Sox will play the Toronto Blue Jays. First come pregame festivities, especially tailored for the occasion. The ensuing spectacle—a carefully scripted encounter between the armed forces and society—expresses the distilled essence of present-day American patriotism. A masterpiece of contrived spontaneity, the event leaves spectators feeling good about their baseball team, about their military, and not least of all about themselves—precisely as it was meant to do. In this theatrical production, the Red Sox provide the stage, and the Pentagon the props. In military parlance, it is a joint operation. In front of a gigantic American flag draped over the left-field wall, an Air Force contingent, clad in blue, stands at attention. To carry a smaller version of the Stars and Stripes onto the playing field, the Navy provides a color guard in crisp summer whites. The United States Marine Corps kicks in with a choral ensemble that leads the singing of the national anthem. As the anthem’s final notes sound, four U. S. Air Force F-15C Eagles scream overhead. The sellout crowd roars its approval. But there is more to come. “On this Independence Day,” the voice of the Red Sox booms over the public address system, “we pay a debt of gratitude to the families whose sons and daughters are serving our country.” On this particular occasion the designated recipients of that gratitude are members of the Lydon family, hailing from Squantum, Massachusetts. Young Bridget Lydon is a sailor—Aviation Ordnanceman Airman is her official title—serving aboard the carrier USS Ronald Reagan, currently deployed in support of the Afghanistan War, now in its 10th year. The Lydons are Every Family, decked out for the Fourth. Garbed in random bits of Red Sox paraphernalia and Mardi Gras necklaces, they wear their shirts untucked and ball caps backwards. Neither sleek nor fancy, they are without pretension. Yet they exude good cheer. As they are ushered onto the field, their eagerness is palpable. Like TV game show contestants, they know that this is their lucky day and they are keen to make the most of it. As the Lydons gather near the pitcher’s mound, the voice directs their attention to the 38-by-100-foot Jumbotron mounted above the centerfield bleachers. On the screen, Bridget appears. She is aboard ship, in duty uniform, posed below decks in front of an F/A-18 fighter jet. Waiflike, but pert and confident, she looks directly into the camera, sending a “shout-out” to family and friends. She wishes she could join them at Fenway. As if by magic, wish becomes fulfillment. While the video clip is still running, Bridget herself, now in dress whites, emerges from behind the flag covering the leftfield wall. On the Jumbotron, in place of Bridget below decks, an image of Bridget marching smartly toward the infield appears. In the stands pandemonium erupts. After a moment of confusion, members of her family—surrounded by camera crews—rush to embrace their sailor, a reunion shared vicariously by the 38,000 fans in attendance along with many thousands more watching at home on the Red Sox television network. Once the Lydons finish with hugs and kisses and the crowd settles down, Navy veteran Bridget (annual salary approximately $22,000) throws the ceremonial first pitch to aging Red Sox veteran Tim Wakefield (annual salary $2,000,000). More cheers. As a souvenir, Wakefield gives her the baseball along with his own hug. All smiles, Bridget and her family shout “play ball!” into a microphone. As they are escorted off the field and out of sight, the game begins. What does this event signify? For the Lydons, the day will no doubt long remain a happy memory. If they were to some degree manipulated—their utter and genuine astonishment at Bridget’s seemingly miraculous appearance lending the occasion its emotional punch—they played their allotted roles without complaint and with considerable élan. However briefly, they stood in the spotlight, quasi-celebrities, all eyes trained on them, a contemporary version of the American dream fulfilled. And if offstage puppet masters used Bridget herself, at least she got a visit home and a few days off—no doubt a welcome break. Yet this feel-good story was political as well as personal. As a collaboration between two well-heeled but image-conscious institutions, the Lydon reunion represented a small but not inconsequential public-relations triumph. The Red Sox and the Navy had worked together to perform an act of kindness for a sailor and her loved ones. Both organizations came away looking good, not only because the event itself was so deftly executed, but because it showed that the large for-profit professional sports team and the even larger military bureaucracy both care about ordinary people. The message conveyed to fans/taxpayers could not be clearer: The corporate executives who run the Red Sox have a heart. So, too, do the admirals who run the Navy. Better still, these benefits accrued at essentially no cost to the sponsors. The military personnel arrayed around Fenway showed up because they were told to do so. They are already “paid for,” as are the F-15s, the pilots who fly them, and the ground crews that service them. As for whatever outlays the Red Sox may have made, they are trivial and easily absorbed. 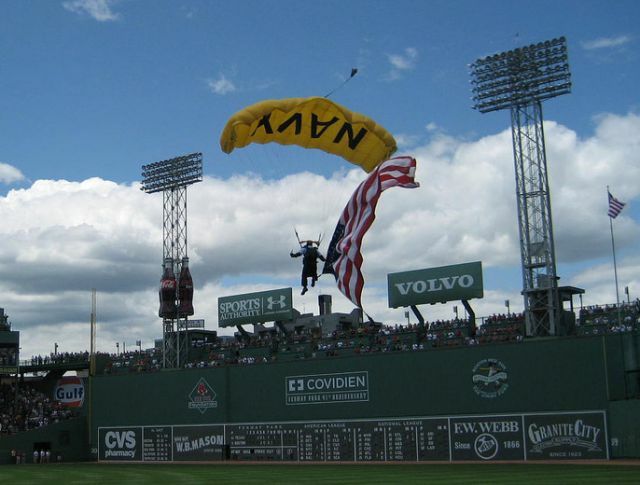 For the 2011 season, the average price of a ticket at Fenway Park had climbed to $52. A soft drink in a commemorative plastic cup runs you $5.50 and a beer $8. Then there is the television ad revenue, all contributing the previous year to corporate profits exceeding $58 million. A decade of war culminating in the worst economic crisis since the Great Depression hasn’t done much good for the country, but it has been strangely good for the Red Sox—and a no-less-well-funded Pentagon. Any money expended in bringing Bridget to Fenway and entertaining the Lydons had to be the baseball/military equivalent of pocket change. And the holiday festivities at Fenway had another significance as well, one that extended beyond burnishing institutional reputations and boosting bottom lines. Here was America’s civic religion made manifest. In recent decades, an injunction to “support the troops” has emerged as a central tenet of that religion. Since 9/11 this imperative has become, if anything, even more binding. Indeed, as citizens, Americans today acknowledge no higher obligation. Fulfilling that obligation has posed a challenge, however. Rather than doing so concretely, Americans—with a few honorable exceptions—have settled for symbolism. With their pronounced aversion to collective service and sacrifice (an inclination indulged by leaders of both political parties), Americans resist any definition of civic duty that threatens to crimp lifestyles. To stand in solidarity with those on whom the burden of service and sacrifice falls is about as far as they will go. Expressions of solidarity affirm that the existing relationship between soldiers and society is consistent with democratic practice. By extension, so too is the distribution of prerogatives and responsibilities entailed by that relationship: a few fight, the rest applaud. Put simply, the message that citizens wish to convey to their soldiers is this: Although choosing not to be with you, we are still for you (so long as being for you entails nothing on our part). Cheering for the troops, in effect, provides a convenient mechanism for voiding obligation and easing guilty consciences. In ways far more satisfying than displaying banners or bumper stickers, the Fenway Park Independence Day event provided a made-to-order opportunity for conscience-easing. It did so in three ways. First, it brought members of Red Sox Nation into close proximity (even if not direct contact) with living, breathing members of the armed forces, figuratively closing any gap between the two. (In New England, where few active-duty military installations remain, such encounters are increasingly infrequent.) Second, it manufactured one excuse after another to whistle and shout, whoop and holler, thereby allowing the assembled multitudes to express—and to be seen expressing—their affection and respect for the troops. Finally, it rewarded participants and witnesses alike with a sense of validation, the reunion of Bridget and her family, even if temporary, serving as a proxy for a much larger, if imaginary, reconciliation of the American military and the American people. That debt? Mark it paid in full. The late German theologian Dietrich Bonhoeffer had a name for this unearned self-forgiveness and undeserved self-regard. He called it cheap grace. Were he alive today, Bonhoeffer might suggest that a taste for cheap grace, compounded by an appetite for false freedom, is leading Americans down the road to perdition. Andrew J. Bacevich, the author of Washington Rules: America’s Path to Permanent War, is professor of history and international relations at Boston University. His next book, of which this post is a small part, will assess the impact of a decade of war on American society and the United States military. To listen to Timothy MacBain’s latest TomCast audio interview in which Bacevich discusses cheap grace and military spectacle, click here, or download it to your iPod here. To stay on top of important articles like these, sign up to receive the latest updates from TomDispatch.com here.